Due to travel and illness we are way behind in on household chores. In trying to get caught up and get all the laundry done we ran out of laundry detergent about halfway through. But did we stop our work and drive to the store to purchase more? HECK NO! I make our laundry detergent with just three simple ingredients. Now remember we live and work on a ranch so we need something that will get out some pretty tough grime on very heavy fabric – denim! This formula works great for us. Now before I get started I must remind you that I’m just sharing what we do here. I’m a rancher. I live in the country. I’m very interested in being gentle on the environment. I always love to save money. I’m just sharing what works for us. OK good – let’s get to it! UPDATE: For those times when I want a little more scent (like cloth napkins & such) I’ve even whip up an easy Laundry-Scent Booster. Only 2 Ingredients? Yes please! But to make my laundry detergent, first I pulled out my ingredients. Borax, Washing Soda, Fels Naptha and my trusty food processor. NOTE: Many people have problems finding Fels-Naptha in their local stores, but I’ve found it on *Amazon here . 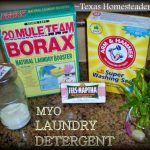 It’s very inexpensive and I think it’s an important ingredient that helps with our tough laundry needs. There are other brands of laundry soap bars such as Zote and others. But I’ve found they just don’t have the same strength to clean heavily soiled fabrics that my beloved Fel-Naptha does. Ok, on to the easy-peasy laundry soap-making procedure. First I unwrap the Fels-Naptha soap and chop it up a bit. Although it’s typical soap consistency it chops very easily. My sister still has children at home and she saves these large ice cream tub lids for me to use as an improvised cutting board. The raised edge keeps everything close so it’s much less messy than a typical cutting board, and it’s a great way to recycle. Then I toss the soap chips into my food processor and give it all a whir until it’s powdery. This fine powder will escape the lid of my food processor while it’s doing its thing so I place a small towel on top of the food processor during this step to help keep the soap dust down. I also like to let the dust settle a bit before opening up the bowl. Use Much Less Than The Commercial Stuff! So I simply pour the mixture into the containers that I keep in my laundry room. A repurposed glass jar holds the bulk of it, and a small rectangular plastic dish holds a smaller amount for easy scooping and lightweight handling. The tiny scoop is a repurposed one from a container of OxyClean, which I add from time to time to my load of whites. There’s a lot of recycling in this method and not lots of packaging waste. NOTE: Please make sure you label these containers. There’s no need in someone picking up an unlabeled container and wondering what’s in it or worse, guessing what’s in it and guessing wrong. A label is a quick and easy way to make sure no one mistakes this mixture for something else. It's easy (and inexpensive) to make your own laundry detergent in minutes. And you only use a tablespoon or so with each load. So it lasts a long time. In a container that has a tight-fitting lid, combine the grated Fels Naptha, washing soda and borax. Store in a sealed container that is properly labeled. Use 1 to 2 tablespoons per load. NOTE: Since the effectiveness of any detergent depends greatly on the hardness of your water, experiment by using the lesser amount, and then increase as necessary. Want To See Our Natural Cleaning Posts? * Affiliate Links – We are currently enrolled as an Amazon Affiliate (others could be added in the future) Occasionally I will insert an affiliate link into one of my posts if I think it may be of interest to you. If you click on one of those links and buy something (almost anything, not just what was linked) I get a small referral percentage from them – the price you pay for those items is UNCHANGED. When you buy something through the affiliate link it’s a great way to support this blog without anything coming out of your pocket so click often! 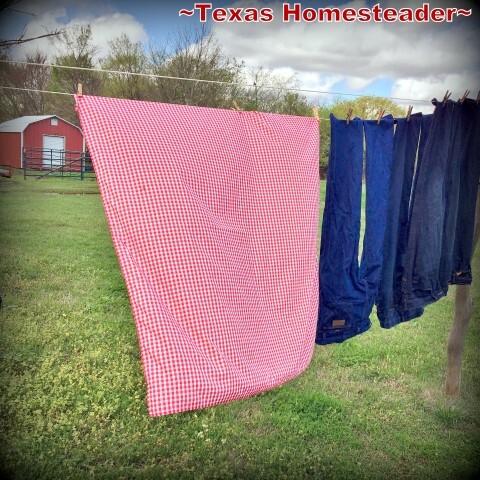 This entry was posted in Blog Posts and tagged Environment, Frugality, Make-It-Yourself on May 7, 2013 by Texas Homesteader. I was wondering if Sunlight laudry bars would work well for this recipe? I have never actually made homemade laundry detergent. Glad to know this is a good recipe, will have to try! Thank you for sharing on #ShareTheWealthSunday link up! Thanks for sharing on My 2 Favorite Things on Thursday – Link Party!! Hope to see you tomorrow !! Love your stuff! Pinned! I wonder if I can use the powder on my front loader? BTW keeping the door open will help much with the odor.I had mine for 3 years now and never had an odor.I clean it once a month with vinegar and baking soda.I always make the liquid laundry soap,but this dry method is so much faster, and will take up much less storage room.I guess if I throw the powder in the drum when loading the clothes would work.I had bad results adding powder to the little compartement ,it always seems to clump up. Also if one over loads the washer it tends to leave the clothes smelly, especially with heavy jeans .Hubby learned that the hard way…:) Yes he does the laundry SOMETIMES. Thank you for all the tips and your posts, I truly enjoy reading them. I have a front loader as well and have used this detergent since its initial post. 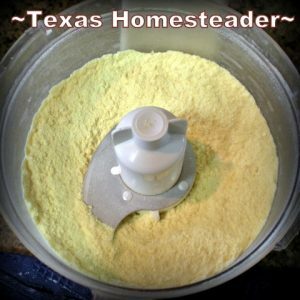 Unlike the commercial brand of powder I used to use that required more, this recipe only requires 1-2 T on most loads and 2-3 T for heavier soiled clothes so it was not enough to ever clump in my washer. I too leave my door open to completely dry and do not have any mildewing. I will swear by its cleaning power and my washer efficiency. I hope this helps. I want to try making the laundry detergent. I have been using natural laundry detergents for years. I have a problem with my whites looking dingy. I cannot use a clothes line where we live. I do not like to use bleach. Any ideas how to whiten whites? Thank you. Fels Naptha is an excellent product but not available readily in the UK *sigh* For toxin free household laundry using the The Breathing Mobile Washer we use Borax substitute, soda crystals, soap flakes, tea tree oil and olbas oil and PLENTY of arm power. Thanks for the recipe! I’ve been making homemade laundry detergent for years, although my recipe is a little different from this one. It smells so much better than the chemical laden store ones! Thanks for your homeacre blog hop submission 🙂 Feel free to stop by this week and submit another! I’ve never made my own detergent, but I’m thinking about it. Visit from Wake Up Wednesday Linky Party. I DIY recipes and think they are safest and most economical way to go. No toxic chemicals to pollute your body or environment. Thanks for sharing. Visiting from Home Acre Blog Hop! This is a fantastic recipe! I’ve been making and using it for about 4 or 5 years. So easy and inexpensive. I’m always amazed now when I walk through the detergent aisle at how much that stuff costs and am so pleased with myself for trying this and saving so much money. 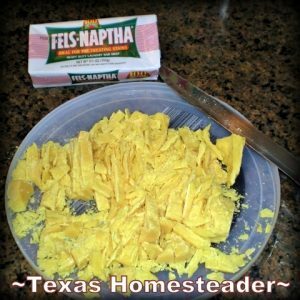 Thanks for sharing – I also had a hard time finding Fels Naptha at the grocery store (I tried several, no luck). One day I stopped by the local hardware store (Ace Hardware) for some gardening stuff, asked if they had heard of Fels Naptha- they had it, borax and washing soda too! Pingback: Tumble-Back Tuesday - MYO Laundry Detergent! I have tried the soap bar laundry soap, didn’t too much care for it, was too watery. You can make your own real liquid detergent like the store bought kind, except without all the harsh and artificial ingredients. Olive oil, grape seed oil, coconut oil, distilled water, borax, and potassium hydroxide. You can also scent it with essential oils, like lavender, lavandin, tea tree oil, etc. I got this recipe from (Bonnie at edential farms, just type on Google (how to make liquid soap with potash or koh) and it should come up. It really is worth it, and making your own soap bars is really fun too. Once you get started, you won`t want to stop. You can make a whole loaf of all natural soap bars, unlike the commercial type soap bars that dry your skin out. Sorry so lengthy, but just wanted to help. It seems everyone is using the soap bar method, but no one really knows about this one. When I use Bonnie’s soap method, and dilute with the water and borax’ I get at least 5-32oz bottles of liquid detergent. We used to buy Ecos detergent, until I had a dream about a doctor was telling me to stop using it, because of something to do with cancer. I took it as the Lord trying to give me a message, and so began my journey on how to make your own liquid detergent. I`ve been making our own detergent since October of 2012, and soap bars with Shea butter, and goatmilk which is the best since June of 2012. God bless. Hi. Can you tell me if Fels Naptha has any fragrance added? I’ve thought about trying this. Your recipe looks good and the benefits sound worthwhile. thanks for sharing this. I have been browsing Pinterest for recipes for this. I will have to try yours! Thanks for the post! This is such a great homemade recipe that I shared it everywhere and pinned it as well. 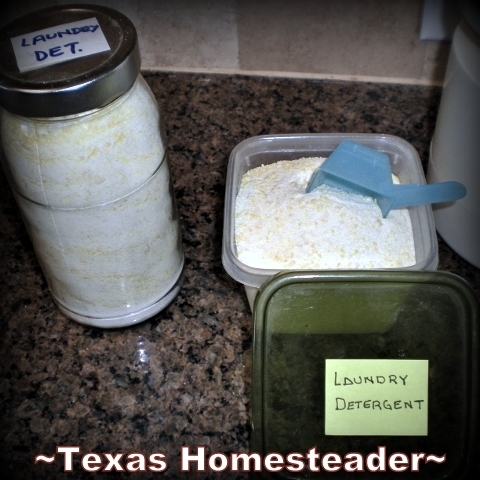 “Save money and the environment with this DIY Laundry Detergent Recipe”. I am so glad I found you on the “Small Footprint Fridays” linkup. I’ve been using a similar recipe for years. Mine additionally calls for Oxy Clean. I have several children and LOTS of very dirty clothes. I’ve not had great luck with this as I feel like it doesn’t get the clothes very clean. It doesn’t even take care of the general dirtiness let alone any stains. They never smell nice either. Sometimes, they really smell bad, kind of like they’ve been left in the washer wet too long, but they haven’t. I’ve tried adding nice smelling fabric softener to help with the smell but it doesn’t do much. I love the idea of making my own detergent and it’s really all I can afford to do, but I’m not very happy with the results. Any ideas anyone? Sheila, Do you have an HE washer? If so, they are notorious for developing a sour smell that transfers to your just washed laundry. I make a similar detergent, but add baking soda to it, also. You can also add white vinegar to the rinse water. Your clothes won’t smell like vinegar but any smell should be gone. Great stuff. Just be aware that Washing Soda is caustic, so WEAR GLOVES and don’t use the same container for food that had the washing soda in it. Just the nurse in me speaking here! I have often wondered how people make their own detergent. Now I know! Thanks for sharing this money saving information! Thanks so much for sharing this recipe! I’m excited to try it! Do you know…is it okay to use on cloth diapers? I LOVE this! I make a similar detergent and I’ve been using it for about a year now. I’m excited to search through your blog and learn more, when it’s not so late. LOL Here’s a link to my detergent “recipe”. 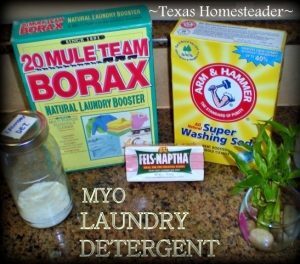 woodsfamhobbyfarm.blogspot.com/2013/04/homemade-laundry-detergent-good.html Thanks for sharing. Yay! Same recipe I use. I use laundry soap made and sold by a friend rather than the fels naptha. Thanks for sharing your post with us last week at Eco-Kids Tuesday!!! Hope you stop by again today! So glad you could make it out to my linking party! My husbands family has a farm back in West Virginia (we’re out in Utah) and it makes me think of his home every time I pull up your site! Thanks again for sharing with us! Thanks for linking up at Wildcrafting Wednesday! Great recipe! I am forever running out of detergent! And I usually have all the ingredients for your recipe 🙂 Thanks for sharing at our ALL MY BLOGGY FRIENDS party !